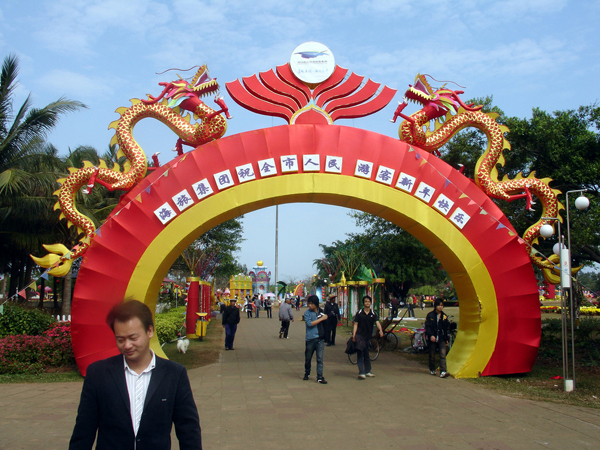 This is one of the most popular recreational facilities in Haikou. It is located on Binhai Avenue, just North of Century Bridge, and is adjacent to Haikou Bay. Evergreen Park has a total area of 1070 mu (~ 71.3 Hectares) and contains nearly 10,000 coconut trees as well as several hundred species of South Asian ornamental plants. Crowds of people gather here for Spring Festival, Lantern Festival and Mid-Autumn Festival, as well as many weekend family activities. Young lovers stroll around the park hand in hand and many become engaged here and even end up married here! Admission is free, and is easily accessible by bus or taxi. Bicycle or electric carts are available for hire at very cheap rates. For a relaxing time, you can enjoy a stroll, fly a kite, drink a beer (or coconut juice) and have a generally good time in Evergreen park. Haikou Tourism Activities Coming Soon!